I think that Christians may be able to learn from Muslims about certain spiritual disciplines in ways that many American evangelicals may not realize. There, I said it. Our spirituality in the U.S. is very private. We don’t like public displays of prayer, Scripture reading, or discussions about our “personal” faith. The so called “public square” is not the place to talk about politics or religion, much less our own spiritual experience! So Christians tend to keep those things very private. We keep to ourselves and do our best to have authentic relations with God, but not if you are watching. Gone are the days where we pray in public over our meals, or thank God publicly for the things that God has done in our lives. And I can really understand the concerns that some have about doing these things. For many, these are just mundane spiritual tasks that we need to check off of our list of “spiritual to-do’s.” And because our culture has become increasingly hostile to or uninformed about the Christian faith, the thinking is that we should avoid complicating things. Enter my observation of Muslims. I am well aware that there are many Muslims who are simply “going through the motions” when they pray, fast, or celebrate different aspects of their faith. It seems as if all religions have their hypocrites. Yet I find the public spiritual practices of many Muslims as a challenge to my own practices. Back in September, I was sitting in an Ethiopian airport when a group of about thirty Muslim men walked off an airplane, coming from Saudi Arabia. I watched as they walked off the plane, headed over to an empty area in the concourse, and then all set down their various backpacks and other carry-on items. They were not rude and did none of this in a way that drew undue attention to themselves (other than being Arabs in an airport full of Ethiopians). Yet I was about to witness an incredible public display of their faith. 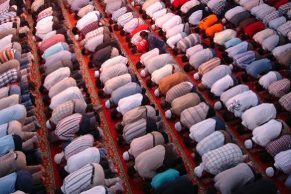 All thirty Muslim men began to get on their knees and pray. And in our attempt to keep our spirituality private, we often don’t “draw attention” to ourselves by participating in public spiritual disciplines. I wonder if this is sometimes more out of fear than missional wisdom. We often avoid public spirituality because we don’t want to offend people or give them the wrong idea about our faith. We want to avoid coming across arrogant or overly-religious. You know, Christianity is about “relationship” and not “religion”… or so the popular idea goes. Perhaps some of our hesitance at displaying our spirituality is based on avoiding the kind of public displays that Jesus condemned in the Sermon on the Mount. Jesus said, “Beware of practicing your righteousness before other people in order to be seen by them, for then you will have no reward from your Father who is in heaven” (Matt. 6:1). I obviously agree with Jesus, so I’m not suggesting we start doing things in the eye of the public so that other people can watch us. I’m simply suggesting that not all public displays of faith automatically make you the hypocrite of Matthew 6:5. The Bible is full of public displays of faith. A key question related to public faith is this: What’s your intention? So I think we might be shooting ourselves in the foot by constantly avoiding all public spiritual practices. Maybe we can learn something from Muslims. I have felt the same way about Catholics in South America and Mexico. There is some shrine where they have to crawl on their knees over broken glass to get to the statue where they worship (Mary, I believe). I don’t recommend we take up this practice, but I do find it somewhat shaming that there are people willing to do that for their god, but we have a hard time denying our flesh enough to get out of bed on a Sunday morning to go sit in a warm, comfy church and sing enjoyable songs, to worship our God. Yeah… that’s a great observation. Wow. Maybe the “comfy church” and “enjoyable songs” is part of the problem? Sometimes I wonder if our comforts just make it too easy… we almost do everything we can to make western Christianity as comfortable and easy as possible. On a side note… crawling on glass sounds crazy!